iPlotter is a digital ink jet plotter using “drop on demand” technology, designed specifically for printing on glass slabs using specific inks, used to reproduce drawings, images and photographs for in the architecture, automotive and furnishing sectors. A dedicated hydraulic system keeps the ink in circulation and a battery of filters eliminates the impurities and air bubbles, thus preventing the nozzles from blocking and almost totally eliminating the machine down times. The latest-generation printer head with drop size management produces high resolution photographic prints with high contrast shading. The standard used is four-color printing (CMYK) while the electronics and software were implemented to use printing types of up to eight colors. 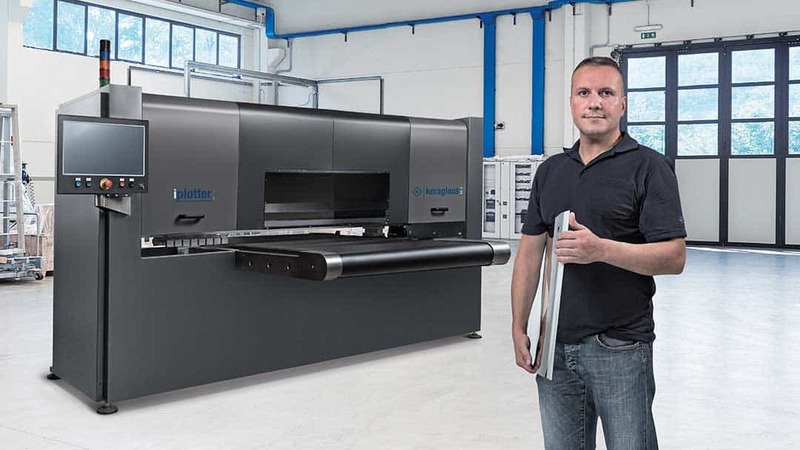 i5 Single Pass is a digital glass decorating system that produces color prints in a single passage. The main machine structure comprises a base with a work top consisting of a conveyor belt with single or double centering guide, fitted with a master module with integrated monitor to control all the printing units. The work top can be freely equipped with independent printing modules, offering full flexibility in terms of the number and position of the colors. An automatic cleaning system, combined with a suction system, reduces machine down times.